OOC: I don't agree. Wendy is close to going mad, she needs to gather some resources for later on---there must be a boss or something at the engine. Action 1 and 2: Gain 1 resource. Action 3: Play Professor Ermitage, spending 2 resources. Sefina again picks the lock to the door into the next car, but this time the lockpick snaps off after the door opens. She hurries into the car and rummages around, finding a sharp knife. -3. Success! 1 clue gained. 1 supply removed from Lockpicks. Action 2: Play Forbidden Knowledge. Fast Action: Exhaust Forbidden Knowledge and take 1 horror. 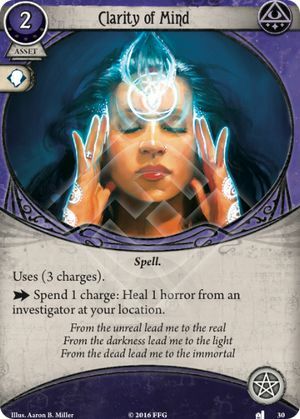 Move 1 secret from Forbidden Knowledge to become resource. 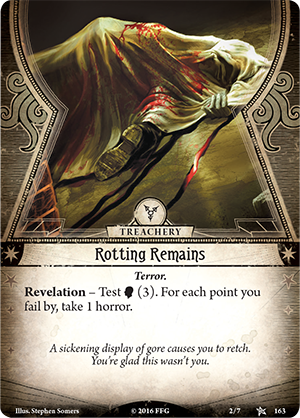 Wendy takes 1 damage and 1 horror[Professor Armitage]. I'm not as familiar with the rules as you are. Do we get to choose which of us the Horror engages, or does it have to be random? If we choose, I'd rather it engaged me, and I'm sure you would too. 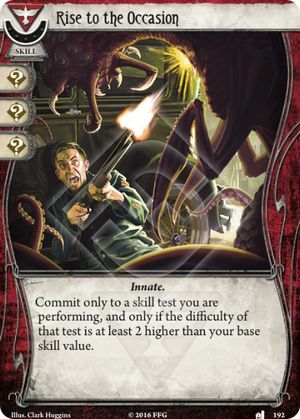 Also, are you sure it gets to move and attack in the same turn? OOC: Yes, with the Hunter keyword it moves first and then attacks. Thematically Sefina can take the hits, I think, she'd be protecting Wendy. Needless to say, I've reversed the attack on Wendy. Sefina draws and gains 1 resource. Wendy draws and gains 1 resource. 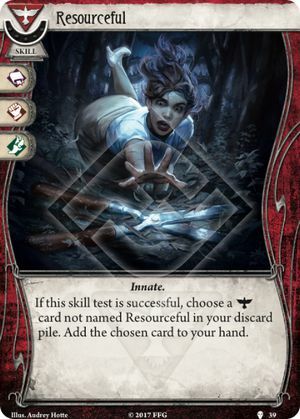 Discard, exhaust Prof Armitage and gain 3 resources. Before Sefina can close the door behind them, the horror wriggles its way through. She barely has enough time to get between it and Wendy before it leaps upon her, wrapping its slimy tentacles around her body and tackling her to the ground. She is cut off in mid-scream as one of the tenatacles encircles her throat and begins to throttle her. All right, I'll take the hit. Sefina takes 1 damage and 1 horror. On my turn, I'll try to evade and hit it with the Knife and Overpower. 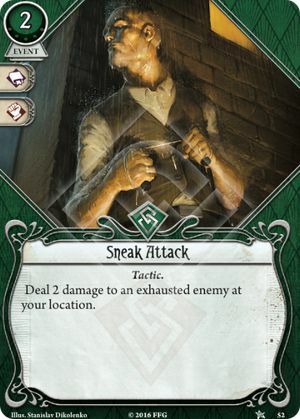 If I can inflict one damage, you can finish it with Sneak Attack. Sefina put herself between Wendy and it, before it could slime her with its mucus tentacles. Thank God! Wendy will do everything to help...but what's this? Place 1 doom on the agenda (3/4). OOC: Yes, if Sefina can damage it then evade it, Wendy'll play Sneak Attack. Remember: Only 2 actions this turn! Sefina somehow manages to wriggle free of the beast. She lunges for it with her knife while it is disoriented, but she narrowly misses, and something falls out of her pocket. I need to evade first, to make sure I succeed. Otherwise, I'll get mauled again, which I can't afford, and you won't be able to hit it. +0. Success! Grappling Horror is exhausted. -3. Failure. Discard Leo de Luca, who I'll never get to play anyway. Even though I missed, you should still do 2 damage while you can, and you have a second action. It won't get to attack this turn, and next turn I should be able to finish it. OOC: Okay. You were right about evading first; I was thinking that attacking after evading meant that Sefina would re-engage but I checked the rules and was wrong. Action 1: Play Sneak Attack, spending 2 resources. 2 damage dealt to Grappling Horror. 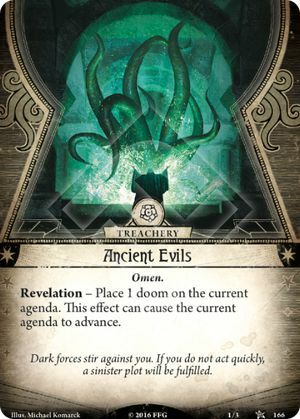 elder sign (+0) ; success! 1 clue gained. Sefina managed to slip out from its tentacles and scramble away. Wendy takes the opportunity as it flaps around with a revolting squelch! squelch!, she wraps a cord round some protruding part and pulls it tight with all her might. It lurches, wounded, a big mucus puddle spreads across the car's floor, but Wendy is thrown like a rag doll. As she sprawls her hand again alights on something, this time it's a cigarette case, "Quite a collection you've got!" she thinks, but when she reaches into her pocket she is gutted to find it empty, "Barneymuggin!" 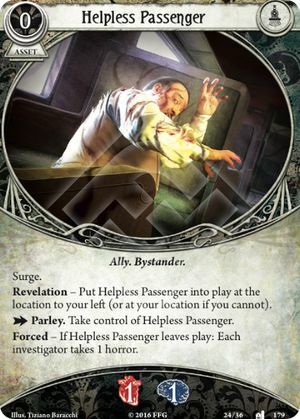 Ready cards: Grappling Horror, Prof Armitage. Wendy draws and gains 1 resource. Oh, nice draws! Clarity of Mind will help heal some horror if I ever have actions and resources to spare. 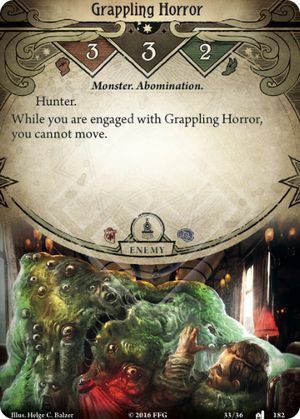 I think the Grappling Horror should engage me again when it readies. 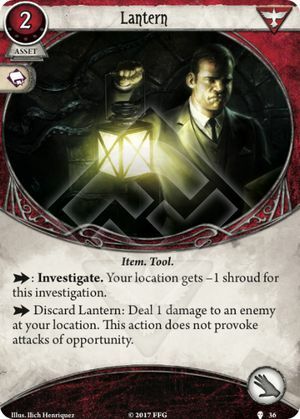 You could actually equip the Lantern and activate it to finish off the Grappling Horror and still have an action left to find the third clue. 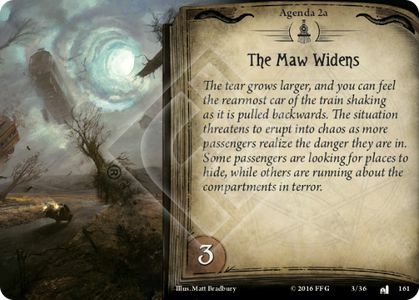 Then I could find the last one and proceed to the next car, provided our Mythos cards don't mess up our plans. OOC: Okay. The Lantern is a great asset. Yes, Wendy'll chuck it at the blob. OOC: Barneymuggin! Um--stay put: Wendy to investigate, Sefina to evade? Sefina screams as she stumbles over a rotting corpse, then screams again as the tentacled horror is upon her once more! "Wendy, run!" she cries. 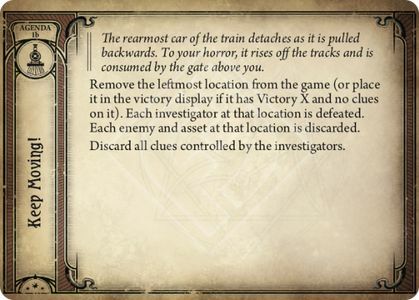 Yes, you should investigate and try to find both remaining clues, moving to the next car if possible. We can't backtrack to help the Helpless Passenger, we'll just have to move fast and get to the engine before that car gets pulled away. You should go first. Then on my turn, I'll try once to finish off the Grappling Horror with Knife and Unexpected Courage. If that doesn't work, then I'll try to evade. I'll also move to the next car if I can. -3. Failure. Take 2 horror. OOC: Realised that Wendy's chances are 50/50, here's a different idea: Wendy to engage, evade[+Scrapper], and draw a card[Prof Armitage? 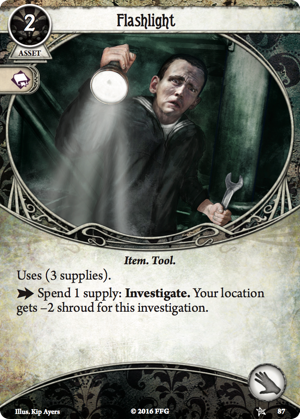 ]; Sefina to use Lockpicks, play Flashlight, and investigate. I don't think that will work. Not only are my hands full, so that I can't equip the Flashlight without dropping something else, but we'd be wasting actions we can't afford to lose, and we need to kill the Grappling Horror rather than burn actions continually evading it. I have a good chance of finishing it with one action, so that you don't need to waste two of them engaging and evading, which might not even succeed. 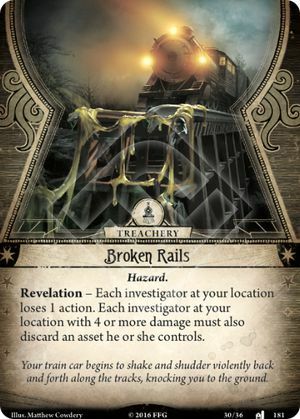 You may only have a 50/50 chance to find a clue when investigating, but you have three chances, which gives you an excellent chance of finding one or two clues. Even if you only find one, I should be able to find the other. Place 1 doom on the agenda (1/3). 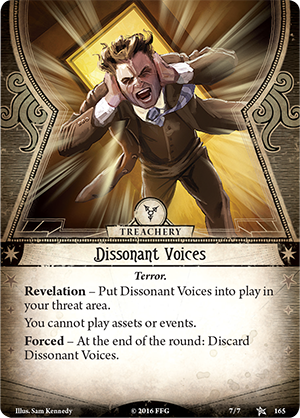 Action 3: Draw a card Discard and exhaust Dr. Armitage: Gain 3 resources. Wendy did try, she searched and searched for clues, but nothing, excepting chewing gum stuck to the underside of seats; Wendy discounts the idea of harvesting the gum, not because of fastidiousness, saliva and God knows what attached to it, but because she seriously doubts that it'll have any flavour. She pauses to turn over a newspaper. "I'll take that, young lady," says Dr. Armitage quickly, peering at its headline before she gets a chance. "Er--not suitable," he explains. The slimy beast wraps a tentacle around Sefina's neck, and two more encircle her wrists and pin them to the floor. As it throttles her, her vision starts to go black. Desperately, she summons all of her reserves of strength, breaks her right hand free, and plunges the knife straight into the center of the monster. With an eerie shriek, it expires and collapses on top of her, melting into horrible goo. Gasping, Sefina digs her way out from under it and catches her breath. Taking out her lockpicks, she sets to work on the door at the door at the other end of the car. She gets it open, but again one of her lockpicks snaps, leaving her with only one. It's a good thing you were able to get rid of that card! -1. Success! Grappling Horror is defeated. Action 3: Play Clarity of Mind, spending 2 resources. "Tut!" says Wendy, looking over Sefina's shoulder whilst rolling a ball of gum in her palm, as the second Lockpick breaks. She starts brushing at Sefina's back but quickly pulls away her hand; it's dripping in monster goo. She flicks her hand and the goo slaps against a window, narrowly missing Dr. Armitage. "Disgusting!" she says. Place 1 doom on the agenda (2/3). 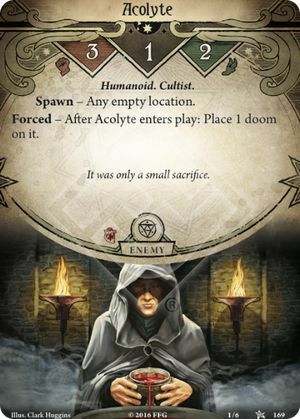 OOC: We'll place the Acolyte in the Parlor Car? I noted that Sefina is down to 3 sanity, time for Sure Gamble? BTW I'm away tomorrow. Sefina screams in terror as she stumbles upon another mangled corpse while looking for a way out of the car. Breaking down, she curls into a ball and lies on the floor, sobbing. Unfortunately, I can't use Sure Gamble. 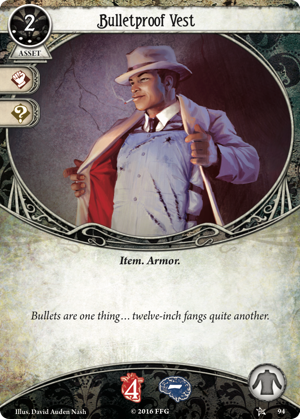 I don't have a copy of The Painted World in hand, and I can't use a regular action to pull it out at this point in time. 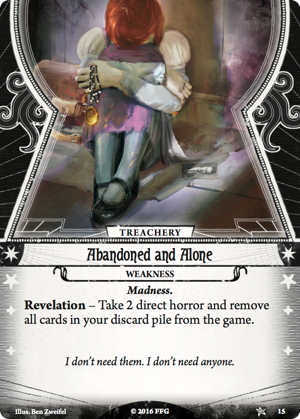 Nor do I have 2 resources, though I could get the second one by using Forbidden Secrets as a fast action. However, that would cost me a Sanity point, which would defeat the purpose. I'll just have to draw and hope for the best. -4. Failure. I take 3 horror and am defeated.